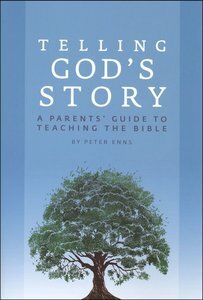 In this accessible and engaging book, Peter Enns(author of the controversial and best-sellingInspiration and Incarnation: Evangelicals and theProblem of the Old Testament) provides parents andteachers with a straightforward and intelligenttwelve-year plan for teaching the Bible. Writtenfor lay readers but incorporating the best scholarlyinsights, Telling God's Story avoids sectarian agendas.Instead, Enns suggests beginning with the parables ofthe Gospels for the youngest students; continuingon with the more complex stories of the Old and NewTestaments for middle grade students; and guidinghigh school students into an understanding of thehistory and culture of biblical times. Peter Enns (Ph.D., Harvard University) is senior fellow of biblical studies for The BioLogos Foundation, an organization founded by Francis Collins that explores, promotes, and celebrates the integration of science and Christian faith. He was professor of Old Testament and Biblical hermeneutics at Westminster Theological Seminary, Philadelphia. He is the author of Poetry and Wisdom; Exodus Retold; Inspiration and Incarnation: Evangelicals and the Problem of the Old Testament and Exodus (NIV Application Commentary series).